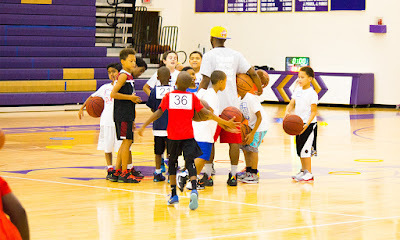 Larry Hughes Basketball Academy St Louis, MO: Want to Rock the Basketball Court? Attend all the Basketball Training Session! Want to Rock the Basketball Court? Attend all the Basketball Training Session! Are you getting passed around on the basketball court? Do you feel out of breath practically minutes after joining a basketball game? Or, do you find yourself getting left in the dust every time you try to keep up with the man that you're guarding because you have the speed of a turtle? If you answered "yes" to any of the preceding questions, there is no doubt that you need to develop either more strength, basketball stamina, better leaping ability, or speed. The good news is that there is a way to improve that specific "weak" area of your game, regardless of which one it might be. The answer: Specificity Basketball Training. What is specificity Basketball training? Basically, it's a way to target train certain muscle groups in your body in a specific way regularly, consistently, and frequently in order for those muscle groups to perform and react the way you want them to under pre-determined situations or duress. For example, since basketball is such a fast-paced sport, your body should be able to keep up with a sudden change of direction while in motion or in a situation where you suddenly had to dive on the basketball court to get a loose ball. And these all will possible by taking training from a personal basketball trainer. With the help of a qualified trainer, you could design different types of training regimens that would condition the different muscles in your body that will help you while playing a game of basketball. The type of exercises incorporated into a workout regimen to achieve specificity training varies depending on the type of sport. For example, the way you would train to get ready for basketball season would be different from how you would prepare for football season. There are numerous types of basketball programs available in Larry Hughes Basketball Academy, which are designed to meet your sport-specific needs such as, core training, speed training, vertical jump training, strength training, endurance training, and flexibility training. If you want to get trained in all the above exercise, consider Larry Hughes Basketball Coach. Well, here you will find all the proficient coaches; all are highly skilled and make all possible efforts to enhance your gaming skills. You just have to attend all the Basketball skills and drills session to improve your basketball skills. Our main mission is to provide the skill development, basketball education, and leadership opportunities for all their players. Here, we have given them opportunities to maximize their talent, grow within the sport of basketball, and develop leadership qualities for success both on and off the court. After asking Larry Hughes that, how will you distinguish between a good team and a great team? He said if you will closely examine both the teams that how they are played in-between games, you will most likely discover that great teams pay more attention to basketball training sessions. Some people think that to become an excellent basketball player and team, all you need to do is play as many as game as you can. But, this is not true. In fact, the main reason to become a better player is a regular practice of basketball training. So, do regular practice and win all the upcoming tournament of boys and girls.